Rachvelishvili and Aladashvili musically understand each other and their approach is the same; the piano and voice intertwine resulting in a constantly interesting musical impulse, as they continually pass the baton back and forth. 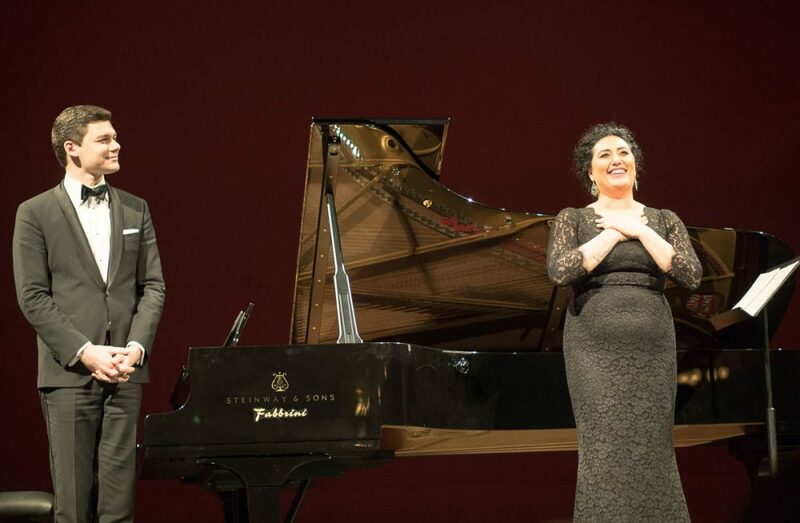 It’s not often that the accompanist for a recital is mentioned in the opening paragraph of a review, but Anita Rachvelishvili’s recital at La Scala with pianist David Aladashvili was a true joint effort, not just musically, but from how they shared the stage. They obviously know each other very well and although Aladashvili, a fellow Georgian, respectfully stayed by his instrument for the beginning of an applause there was no doubting his importance throughout the programme. Rachvelishvili and Aladashvili musically understand each other and their approach is the same. The piano never mimics the voice, following along obediently with just a little less volume, and then let of the leash for some keyboard wizardry when the singer is silent. No, here the piano and voice intertwined resulting in a constantly interesting musical impulse, as they continually passed the baton back and forth. So, let’s start with the pianist, instead of leaving him as a footnote to the review. Aladashvili drew attention first and foremost with his playing, technically adept and winningly expressive, which meant that his impish antics were delightful; if he weren’t such a fine musician his behaviour would have been irritating. When someone called out (in Italian) ”Anita, you’re the best!”, he turned to the audience and said (in English) “And me?”, followed by a big grin before holding a hand in front of his face as though hiding his blushes from being so impudent. During the encores, a voice yelled, ”Carmen!” and he started playing the introduction to the Habanera before they segued into a different aria entirely (Saint-Saëns’ Mon cœur s’ouvre à ta voix; gloriously sung and well-suited to her voice). When they did arrive at Carmen, he began by playing a few notes of another piece before turning his iPad upside down, transforming the notes into the familiar dum de-dum dum intro to the Habanera. It was great fun and he’s an absolute delight. To say that Rachvelishvili is impressive only because of her extremely powerful voice, or her uniform yet extended registers, is to ignore her keen musicality, attention to detail, and her delicately coloured and engaging interpretation. She grabbed the attention of the sometimes prickly La Scala audience the moment she first opened her mouth and they stayed in her grasp until her last note; no one was rushing out to get their coat this time. Rachvelishvili is a ‘local girl’, having studied at the Academy of Lyric Opera at the Accademia Teatro alla Scala from 2007 to 2009, after which she was suddenly thrust into the spotlight when Daniel Barenboim wanted her as his Carmen for the prestigious opening of La Scala’s opera season, in 2009. She has returned as Isabella and Amneris, as well as for a Verdi Requiem and revival of Carmen, but this is the first time that the Milanese crowd has been able to appreciate the scope of her talent. In her recital, she passed from home composers Otar Taktakishvili and Nikoloz Rachveli-Memanishvili and near neighbours Tchaikovsky and Rachmaninov, to de Falla’s Seven Spanish Folksongs and canzoni from Tosti and Rossini. Each song was placed judiciously within its own frame and respected the limits set by the composer and the text: Rachmaninov’s Vocalise was captivatingly intimate, yet surely there must have been a hidden microphone for her impressive opening and closing low notes of de Falla’s Polo! The world premiere of three songs by Rachveli-Memanishvili: composer and arranger, and Principal Conductor of the Georgia National Symphony Orchestra. The cycle is entitled Il resto è silenzio (Hamlet’s dying words, “The rest is silence”) and inspired by the plight of refugees and those who suffer from war and terrorism. The first piece uses verses by one of Georgia’s greatest poets, Vazha-Pshavela, which talks of ‘black waters’ and finishes with the words, “I tried to help them, but I was incapable of doing so.” The second is a lullaby of great melodic beauty which contrasts with a strikingly dramatic setting of Paul Celan’s poem Todesfuge. Three emotionally strong and affecting pieces which deserve a recording. A marvellous gift to both the two artists it is dedicated to and who performed it exquisitely, and to the La Scala audience who let its appreciation be heard. Rachvelishvili’s name – pronounced ‘rotch-VELLesh-VEELee’ – has something in common with the other Georgians on the programme, composers Taktakishvili and Memanishvili and her pianist Aladashvili. The suffix ‘-shvilli’ means ‘child’, so Rachvelishvili mean ‘the child of Rachveli’.